This activity is a didactic, funny and entertaining game during which the players will demonstrate their skills by participating in different tastings and culinary tasks. The group will be divided into smaller teams depending on its size. 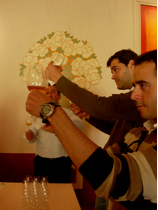 They will then rotate within different thematic stalls such us: blind cheese tasting, wine or beer tasting course, tapas cooking contest, olive oil tasting, Iberian ham and the skill of carving. This gastronomic experience is designed for anyone who sees the significance of distinguishing and appreciating the different aromas, textures and colors of various Spanish Gourmet products. Guided by culinary specialists, our aim is to provide a combination of culinary and cultural knowledge by participating in our activities and tasting the best of each Spanish cuisine and wine regions. We will leave your staff plenty motivated.